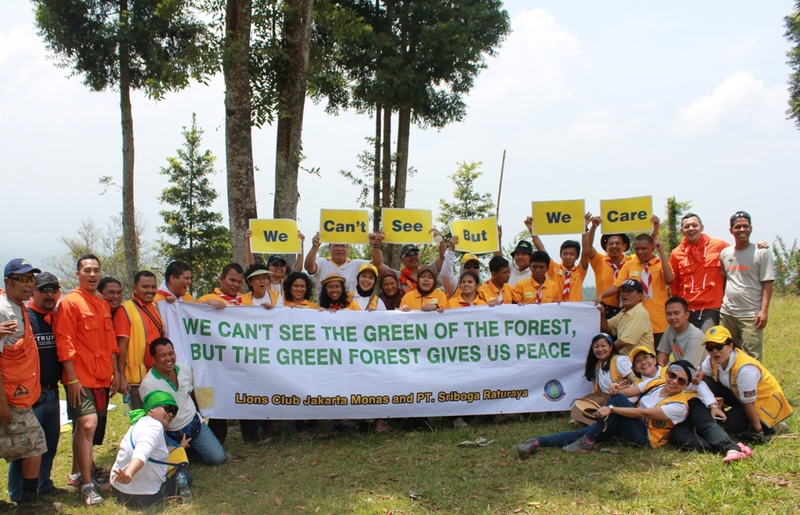 Lions Club Jakarta Monas commemorated the World Sight Day by having a Camping and Tree Planting with children having visual impairments or blind. The objectives of the activity were to share happiness with blind children by introducing the blinds to the natural beauty of a forest in the mountainous areas and planting trees at the critical land areas. The camping ground was located about 3 hours drive (100 km) from Jakarta. After reaching the camping ground area, lunch was served and continued by bathing under the waterfall. Along the way to the waterfall, the blind children were introduced to different types of trees by allowing them to touch and stroke the trees. The blind children showed their talent during dinner time. Nena was on organ, Ayu was the singer and the rest joined the happines by dancing along the night and the ambiance getting warmer when the bonfire was lit. The night was closed by sleeping under the tent for the blind children and all other participants. Senam Yama or Yama gymnastic which is originated from the traditional Indonesian martial arts opens the day. After breakfast, the tree planting activities was started. Tree planting process is al so a good time to learn about tree seedling, organic compost, polybags, and how to make planting holes. By noon, the activity was ended with lunch together. “I am very happy as I experienced many new things today: hiking, waterfall, and planting trees. The weather here is very nice and cool “ (Irma). ‘ I deeply thanks to Lions as they have brought us to the waterfall , eventhough the rute is callenging. Hope all will get blessing from God” (Novi).